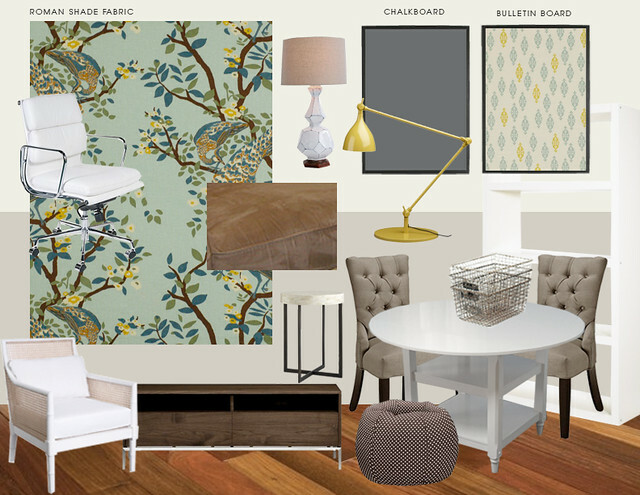 Recently I designed a design board for an e-decorating client's family room. This room was many things - a play/study area for children, a workplace for parents, and a lounging/tv watching area for family. I couldn't help but use one of my favorite fabrics in the board. 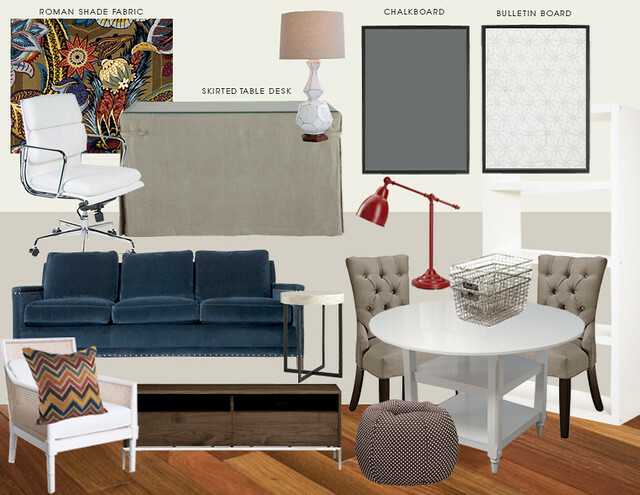 I thought it may be fun for you guys to see how one room can transform.. this is really how working with clients works.. the plan is organic and ever-changing! Both are fabulous. Especially love the bulletin board in 2nd arrangement. Been looking for a great ome for about a year. I guess if i want that look it needs to be custom made or diy? Really like the color scheme in both those rooms! It's beautiful! I love how you tweaked it by changing the shade fabric. I have an "interior designer question"... when you're designing for a client, do you usually get info from them on what style they want and what feeling they are going for and design around that, or when they come to you are they interested in totally letting you do the room in your designer style? Or is a little of both? Yup, it is actually a little of both. And it depends on the client. However, I always ask for inspiration pictures from my clients so I can get a sense of their style. It's not necessarily like "I want to recreate this room", but more like "I like the feeling of this room". If I see a couple pictures they like, I can get a sense of their style. I hope we get to see the finished room. I really love both options, but that blue couch is stunning! Do you help your e-clients with layout and furniture placement too? They are both lovely but I'm really drawn to the colors in the second one. The bulletin board fabric is my favorite...and that media console. Bryn, I really do love all your mood boards! You're a rockstar! Any way you can share the source of that white lamp? It's awesome. It's new from West Elm. I love it too! Wow, I really LOVE both mood boards. The first one is my favorite just because of the bold colors, but the revised one will be lovely, and you're right - it's all about what your client wants, so bravo! I love both boards! I've go the same desk chair and it's so comfortable. I love the fabric you picked for the bulletin board! I used your steps to make my own board a couple of weeks ago and it turned out so great and was very simple. Thanks for sharing! I loved that navy sofa you chose for them, but the room still looks amazing with their original!